Being new to Malaysia business environment and culture, it is a norm for foreigners get confused trying to figure out the right company entity to set-up to meet their business objectives. It is advisable to understand the difference between Labuan International Company and Malaysian Sdn Bhd. These are the most common business entities can be owned by foreigners who like to start a business in Malaysia. Depends on the nature of a business, not all types of businesses under Malaysian Sdn Bhd allow foreign-controlled ownership (more than 50% shareholding). This is simply to avoid duplicate businesses to protect Malaysians rights and livelihood to be a safeguard. Business nature such as import, export, trading, consultancy, and restaurant businesses required permission for foreign ownership by Ministry of Consumerism Trade and Cooperatives. Approvals are usually stringent with a requirement of full set-up office, local town council licensing, inspection of the premise, etc before the approval can be granted. 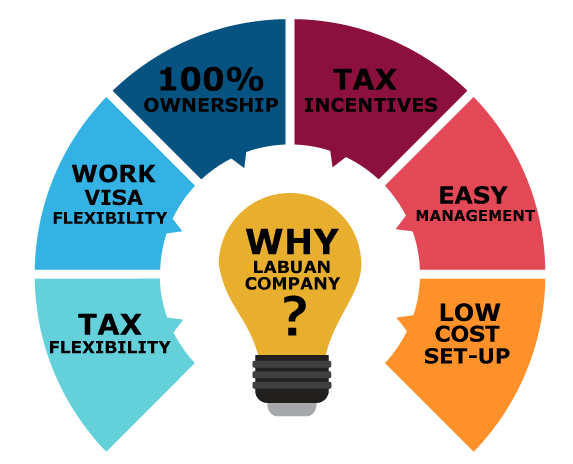 All types of businesses operate under Labuan International Company can be owned 100% by foreigners which is compatible with international offshore companies status. However, Labuan Jurisdiction is an midshore, hence all Labuan companies are allowed to deal with Malaysians with different tax regime. The most common business such as import, export, trading, consultancy does not require any trade licenses. Very simple structure to set-up with the requirement only minimum one director and one shareholder, both positions can be the same person. The ownership and directorship of the company is crucial to the company structure to ensure smooth operations which required the consent of the directors’ attention for operation resolutions, audit reporting, bank account opening and tax issues. This can disrupt the operations of the company if one of the Director does not co-operate fully. This applies the same for both Malaysian Sdn Bhd as well as Labuan International companies. Labuan International Company is just so simple, all within your full control! Without much hassle, you can just operate all by yourself! Labuan International Company is permissible to trade with Malaysian companies and resident with the requirement of a declaration to Labuan Authority and the corporate tax earned of the transaction payable at 24% rate (which is same as local company tax rate) with an audit report. Yearly maintenance for Malaysian Sdn Bhd is a must to appoint secretarial, audit and tax agent, whereas Labuan International Company only requires the appointment of secretary with the audit is optional depends on your business nature-based tax declaration of the year and tax agent is not required. It is not straightforward to apply two (2) years’ renewable work permit DP 10 under Malaysian Sdn Bhd company without full office set-up, a fixed phone line and minimum paid up capital of RM 350,000 to RM 1 million – depends of shareholding structure, business nature and current transaction activities to justify the visa application lodge to immigration for hiring an expatriate. A brand new company applying for a work permit will be much harder to get the approval as further justifications of a good company profile, unique products and services offered, governmental support letters will be required. The whole process for approval may take up to 3-4 months or more if the relevant departments would like to inspect your office prior to approval is granted. All invoices issued by Labuan International Company must be in the foreign currency of their choice. There are two options of banking facilities available for Labuan International Company to chose, namely onshore banking and offshore banking. For the onshore banking, we will set-up both RM and foreign currency account to facilitate your transaction. If you require offshore banking, the bankers can be in Labuan or other nearby countries such as Singapore. Do let us know your banking needs, we will advise you according to your profile and eligibility to match the banker’s compliance. Malaysia Government has implemented the SST system, applicable to all Malaysian Sdn Bhd companies that have turnover more than RM500,000 per year. Labuan International Company will not be subjected to the SST system if your sales revenues are derived internationally. For local Malaysia sales revenue of above RM500,000 in a year, Labuan Company would also be subjected to SST registration requirement. ⇒Tax and compliance are flexible! ⇒Lower initial cost set-up without need office! ⇒Faster way to obtain a residency visa! Speak to us before you start up your Malaysian investment to ensure the right entity and structure! Feel free to contact us at +603-2181 2882 for an appointment or email your inquiry by clicking below button today! We “Simplify Your Business Investment” in Malaysia.